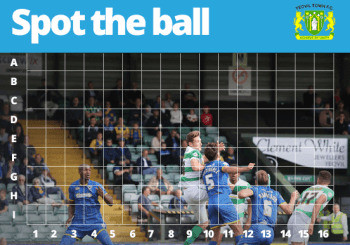 Howards Yeovil and Howards Used Car Centre brings you ‘Spot the Ball’ competition! We have 4 sets of 2x tickets to give away to see the Yeovil Town vs Crawley Town next Saturday on the 23rd of January at Yeovil Town Football Club. With these tickets you will have access to the Seavington Suite which includes a 2 course carvery meal before the match kicks off at 3pm! (See itinerary below). To be in with a chance of winning 2 tickets for this match, all you have to do is enter our Spot the Ball Facebook competition. To enter, simply comment on our Facebook post with the name of the cell in which you believe contains the football. You have until Wednesday the 20th of January to enter and the winners will be announced at 12pm! Good luck! All entries must be posted on the Howards Facebook page. You can enter by posting a comment on the competition Facebook post. Winners to be announced on Wednesday 20th of January at 12pm, entries after this will not count. 1:00 - Arrival at Huish Park using the main entrance situated at the middle of the Tamburino Stand, where Jason Jones will meet you and you will be shown to the Seavington Suite. 1:05 - you will be shown to the Seavington Suite. 1:30 - Your pre-match 2 course carvery will be available from the Alec Stock Lounge. 4:45 – End of the game and time to reflect on the match in the comfort of your suite.